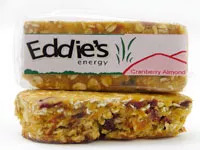 When Eddie’s Energy Bars came across my desk last week just after lunchtime, my intention was merely to take a nibble. I opened one of the Almond Double Chocolate Chip bars and broke off a piece. It was delightful: cakey and not-too-sweet, with absolutely none of the chemical aftertaste you get with most energy bars. Which makes sense, since the ingredients are all-natural. It tasted so good that I polished off the whole thing! When Eddie’s Energy Bars came across my desk last week just after lunchtime, my intention was merely to take a nibble. I opened one of the Almond Double Chocolate Chip bars and broke off a piece. It was delightful: cakey and not too sweet, with absolutely none of the chemical aftertaste you get with most energy bars. Which makes sense, since the ingredients are all-natural. It tasted so good that I polished off the whole thing! Unfortunately, that little bar had 270 calories and 8 grams of fat. Workout snacks are supposed to give you just enough fuel to get through or recover from a workout, not cancel out the effects altogether. But during that morning’s quickie cardio session, I’d probably burned only 250 calories, tops. Plus, that’s just too much fat. Still, I’m not willing to write off these bars—and I swear, it has nothing to do with the fact that they’re made in Vermont, minutes from where I grew up. It’s just so rare to find a truly tasty energy bar. Luckily, the Cranberry Almond and Cranberry Orange bars have fewer calories (232 and 240, respectively) and less fat (3 grams each), with a good mix of carbs and protein to help fuel and repair muscles. And they taste amazing, too. Those two bars have earned a spot in my fridge for superlong, feel-lots-of-burn workouts, or even as a portable, nutritious breakfast. And sure, I could always break one in half for a shorter sweat session...but that might be asking for trouble. These are too yummy to stop halfway. Pros: All-natural ingredients, truly tasty, good mix of carbs and protein. Good for a portable breakfast or refueling after a long workout. Cons: At 230 to 270 calories each, they’re a little too much fuel for an everyday energy bar. Extra tips: Keep ’em in the fridge. They’re made without preservatives, so they’ll stay fresher longer in the cold.